Can Fournier 2818 blue invisible ink playing cards be marked perfectly? For other people, Fournier 2818 red invisible ink playing cards can be marked for a long time while blue cards comparably difficult to be marked. However, this is only for other people, our Fournier 2818 blue cards can also be marked perfectly. Our newest and best solution, which is developed by our GS marked cards company recently, can be applied into the Fournier 2818 blue invisible ink playing cards. The marks can be seen very clearly under the casino light condition. 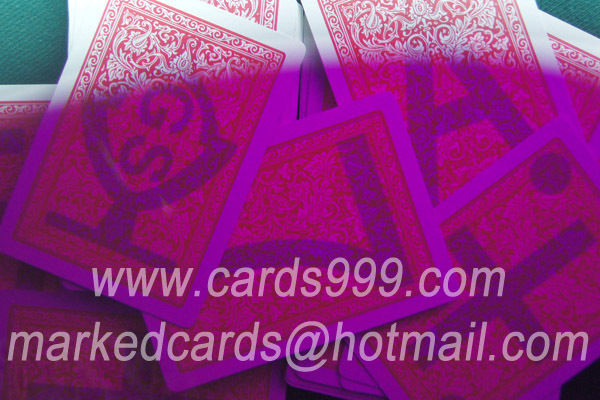 We have high quality products, no matter red cards or blue cards, all of them can be marked as best invisible ink playing cards. Whenever, technology is the most important thing. Here we have good quality, good service, of course good products, it is no denying that you can get a perfect result by our Fournier invisible ink playing cards poker. 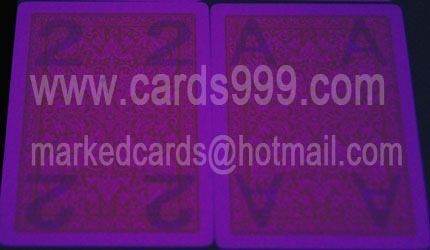 Same as other plastic invisible ink playing cards, Fournier 2818 marked cards also can be marked in different ways. Blue cards: marked with big font in the middle (white mark). Red cards: marked with big font in the middle or small fonts in 4 corners (white or black marks). All of our invisible ink playing cards can work with luminous contact lenses, infrared contact lenses, Texas Holdem and Omaha scanner system, phone analyzer. Fournier 2818 is extremely popular in Russia, Ukraine and France. Fournier marked cards are made 100% plastic, they can be used in all poker casinos and poker clubs. Many colors are available: red, blue, orange and green.